With 2018 going down as the year that the FCC repealed net neutrality, the agency's chairman took a victory lap today (via Ars Technica). 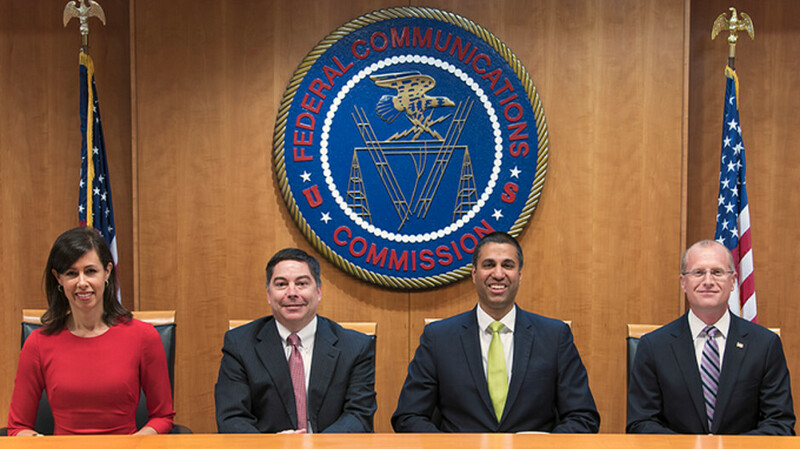 Ajit Pai, who was inserted into the chairman's role by President Donald Trump in 2017, presided over the removal of the Obama-era rules last June. Net neutrality forces ISPs and wireless providers to treat all streaming content the same, and prevents the carriers from blocking content that they may not philosophically agree with. The Congressional Review Act could have reversed the FCC's move, and while the bill passed the Senate, it fell 38 votes short in the House. Pai released a statement that started out praising the House for failing "to reinstate heavy-handed Internet regulation." While the FCC is fighting a lawsuit that seeks to overturn the repeal of net neutrality, something bigger is on the horizon and it starts tomorrow when the Democrats take control of the House. And that means that the FCC will now be under the control of Senate. Rep. Frank Pallone (D-N.J.), the new chairman of the House Energy & Commerce Committee. Pallone has already said that he and other Democrats will "protect net neutrality." While the Congressional Review Act can no longer be used to reverse the FCC's repeal, the Democrats in the House could try to get a new bill passed. But even that route could be difficult since any federal legislation would have to be signed by the president, and the Democrats do not have the votes in the Senate to overturn a veto. The best shot that the Democrats have to restore net neutrality could be the suit filed by 22 state attorneys general, the AG of Washington D.C. and several tech firms in the U.S. Court of Appeals for the District of Columbia. There is much at stake in this lawsuit, especially since California has held off enforcing its newly passed net neutrality legislation until after the court makes its ruling. Whatever occurs, 2019 could be a very meaningful year for net neutrality. "I’m pleased that a strong bipartisan majority of the U.S. House of Representatives declined to reinstate heavy-handed Internet regulation." The GOP led House at the time refused to even bring it up. There was nothing bi-partisan ab out it, in fact the CRA was passed Bi-Partisan in the Senate. He is just gloating now to let his sponsors know that he has done his job as they paid him to do. After the next president removes him, he can look forward to a cushy job on wallstreet or otherwise for a big telco. Finally, Americans won this! Good to see that now people who earn proper bucks can have Superior and proper benefits compared to others. Need to bring more stuff like this. Why do you deserve to have better and faster internet over a student who can’t afford to pay for those benefits because of forever increasing university tuition? Why does a person who pays more for a house deserve better living conditions than a student in an overpriced university? Why does a person who pays more for a vehicle deserve to have a faster car than a university student’s beater? Capitalism, that’s why. You pay more, you get better. People like you are always confusing capitalism with public utilities, which the internet has become whether you like it or not. One little slip up in your life like a health issue or disability will put you straight into the category you mock. I can't think of a better person it could happen to. Ignorance is bliss for someone like you I guess. But net neutrality doesn't mean we all get the same network connection (speed). If I pay for a 1 Gbit connection, I don't want to pay extra because they throttle NetFlix. its okay man. no one in the current generation wants to earn anything or work hard. They want free hand outs and blame the people that worked for their success for their own laziness. Net neutrality doesn't mean everyone has the same internet speed. If you pay 200 bucks for 1 GBit and someone else pays 50 bucks for 100 Mbit, your connection is still faster than the other one. I am glad I live in a country where net neutrality is still a thing and providers won't be able to screw over consumers with extra cost. Good. This isn’t Europe. We don’t need nanny state regulations on our internet. Be happy then when you get screwed over by providers and have to pay more for the same services. I am glad I live in Europe and not USA. Does anyone actually know the core of net neutrality is. Here is a history lesson. Way back in the 90's isp's went to the fed and asked how the network infrastructure would be handled private or common carrier. The feds said it will be private it is your infrastructure and common carrier rules will not be applied. So they built their infrastructure and the government now wants to basically own it. It is no different then the government saying you must open up a guest network on your wifi ap. Then anyone can use and if the whole neighborhood is on you cant throttle them even though you paid for everything. Your telling me that is fair. The difference is I don't/can't charge for access to my guest network. My internet provider is paid to provide me internet access at a particular speed. It shouldn't matter what i'm doing. Now my ISP can slow down Netflix, unless Netflix is willing to make a deal with the ISP. Interesting that you mention that scenario, since I believe that happened with Comcast and Netflix. Netflix sued Comcast for throttling their users, and won. I was on Comcast at the time, and Netflix was barely watchable. Miraculously, after the lawsuit resolved, Netflix suddenly worked fine. So, in some ways the industry will regulate itself. But it can take some time and some people will get hosed for awhile. Another potential problem comes when an ISP is the only game in town. Hard to vote with your wallet, when their is only one choice to purchase. Back in the 90's no one knew what the internet could do. It's normal practice for a new industry to eventually come under some form of regulation. Otherwise we'd still have extracts of the Coca leaf in Coca-Cola for example. Or asbestos in our building materials.